The Death of Sacred Texts draws attention to a much neglected topic in the study of sacred texts: the religious and ritual attitudes towards texts which have become old and damaged and can no longer be used for reading practices or in religious worship. This book approaches religious texts and scriptures by focusing on their physical properties and the dynamic interactions of devices and habits that lie beneath and within a given text. In the last decades a growing body of research studies has directed attention to the multiple uses and ways people encounter written texts and how they make them alive, even as social actors, in different times and cultures. Considering religious people seem to have all the motives for giving their sacred texts a respectful symbolic treatment, scholars have paid surprisingly little attention to the ritual procedures of disposing and renovating old texts. This book fills this gap, providing empirical data and theoretical analyses of historical and contemporary religious attitudes towards, and practices of text disposals within, seven world religions: Judaism, Islam, Christianity, Hinduism, Buddhism, Jainism and Sikhism. Exploring the cultural and historical variations of rituals for religious scriptures and texts (such as burials, cremations and immersion into rivers) and the underlying beliefs within the religious traditions, this book investigates how these religious practices and stances respond to modernization and globalization processes when new technologies have made it possible to mass-produce and publish religious texts on the Internet. Contents: Introduction, Kristina Myrvold; Accounts of a dying scroll: on Jewish handling of sacred texts in need of restoration or disposal, Marianne Schleicher; Relating, revering and removing: Muslim views on the use, power and disposal of divine words, Jonas Svensson; A fitting ceremony: Christian concerns for Bible disposal, Dorina Miller Parmenter; The death of the Dharma: Buddhist sutra burials in early medieval Japan, D. Max Moerman; Rites of burial and immersion: Hindu rituals on disposing of sacred texts in Vrindavan, MÃ¥ns Broo; Is a manuscript an object or a living being? 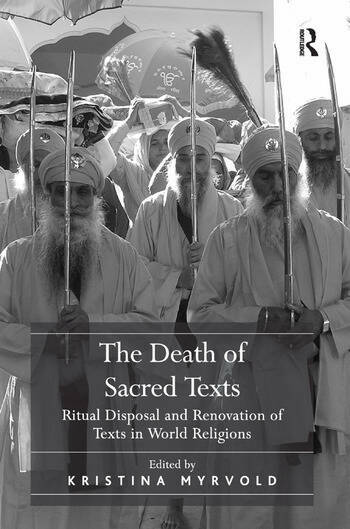 : Jain views on the life and use of sacred texts, Nalini Balbir; Making the scripture a person: reinventing death rituals of Guru Granth Sahib in Sikhism, Kristina Myrvold; Disposing of non-disposable texts: conclusions and prospects for further study, James W. Watts; Index. Kristina Myrvold is Assistant Professor of History and Anthropology of Religion at the Center for Theology and Religious Studies, Lund University, Sweden. Her research focuses on religious practices, identity formation and historiography among the Sikhs in India and in different diasporic settings. She is the author of "Inside the Guru's Gate: Ritual Uses of Texts Among the Sikhs in Varanasi" (2007) and co-editor of a forthcoming publication about the Sikhs in Europe.